This painting shows a woman who is circled by two fish and a blank sheet of paper with only a coffee stain on it. Fish is a universal symbol of transformation. Just like the sheet of paper the woman is a blank sheet waiting to be transformed into whoever she wants to be. Our identity is an active project, it can be transformed over time and through our circumstances. We can write it and rewrite it as we please. This is what I tried to express through the painting. We get stained by circumstances, but those stains give character and add to our lives. Stillschweigend is German for “keep quiet”. Sometimes we need to keep quiet about who we are, where we are and where we want to be. The fewer people know about your personal growth (symbolized by the ferns around the portrait of the woman) the better, it allows you to do your thing without the judgment from others. It is also true that the things you tell people about yourself are far less true than the things you show through your deeds. There is no need to tell people about your transformation, for if it is true it will speak for its self. We can see the woman in the painting is content and happy even if she is a mere picture on canvas… Let your vibe do the talking. 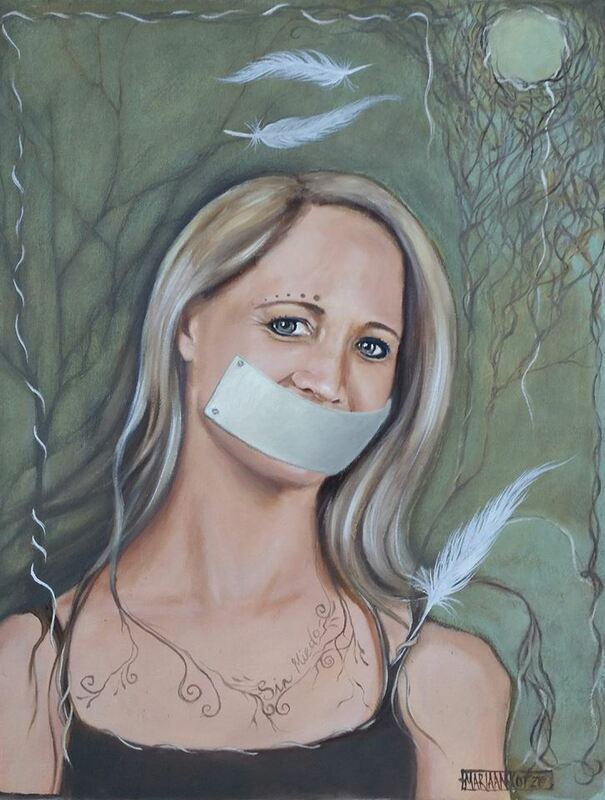 Much of the meaning behind this painting “Silence is virtue” is explained in Stillschweigend. For instance the way I feel about keeping quiet about goals etc. These two paintings share the theme of growth as well as the more obvious, silence. The three feathers in this painting symbolize freedom and inspiration. According to many native cultures from various places on the planet, feathers are messengers from the gods, for me, messengers from angels, or simply a muse. Omens, showing us the way. “Sin Meado” meaning “without fear” in Spanish. We should all aspire to dream and grow without fear. 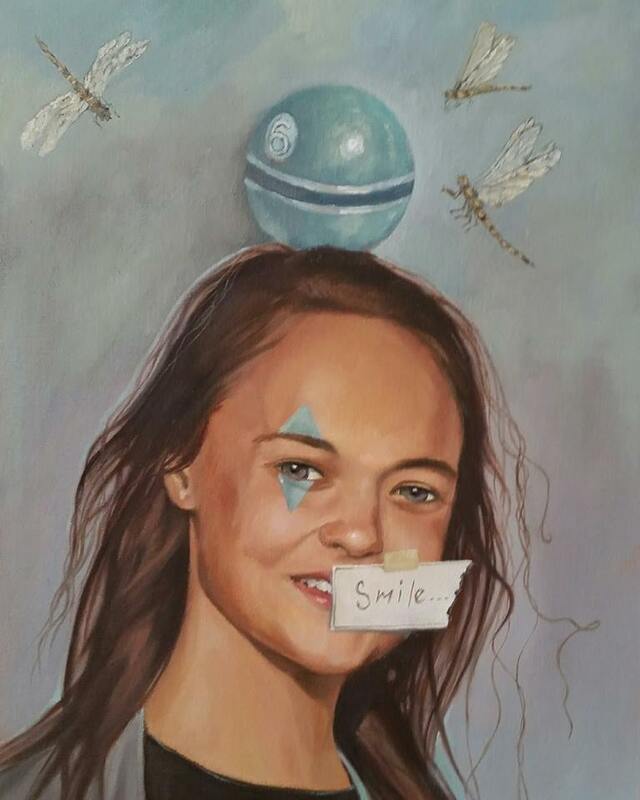 In this composition we see a young girl, she has triangles painted above and below her eye, like a harlequin and a piece of paper is pasted over her lip saying “smile”. On her head is a no.6 ball and there are dragonflies flying around her head. This painting is a message to children from their parents, in this case, the mother. She wants her children to always be happy (the “smile”) The dragonflies symbolize adaptability to change, the mother wants her children to know that they can always adapt and that they can handle the curve balls life throws at them. 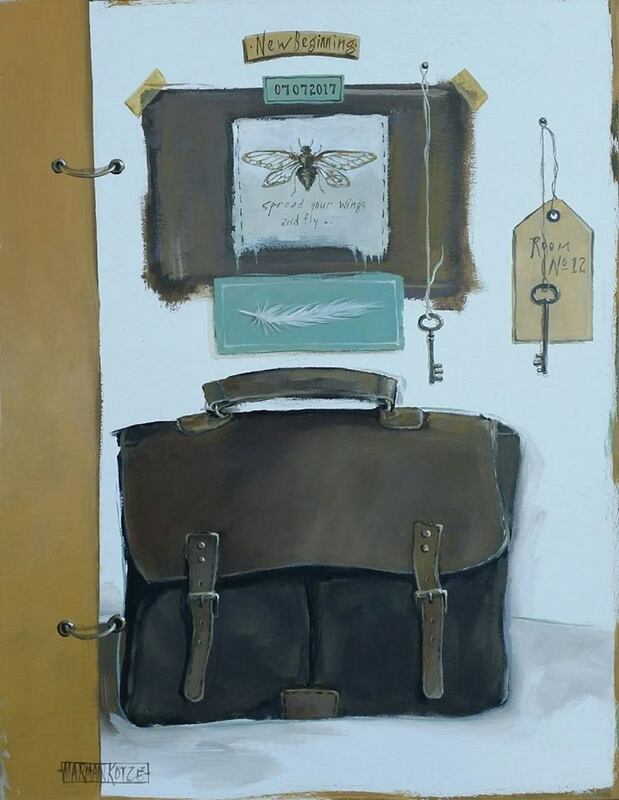 This still life contains a suitcase on a surface, also on the surface is a feather. There is an envelope with a letter in it levitating in the air and three keys hanging from the wall. The theme of this artwork is the journey of life. 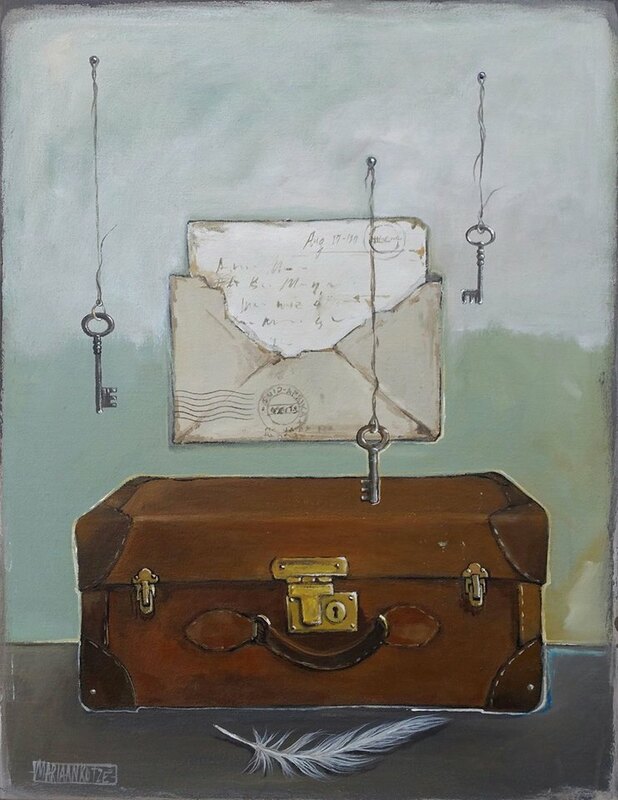 The suitcase can symbolize either literal or figurative travel. The letter is the stories we accumulate over time, as well as the people we meet along the way. The keys are symbolic of our opportunities in life, each key unlocks a door to some other path in life. The feather is once again a symbol of the messages or our angels in life. The question is where each key will take us, on which journey will we go if we choose to use the key and how will it affect the other elements in our journey. This is once again a story of a life journey, but in this case a specific time. It is the time of a new start. A key has been used and has unlocked No 12. One viewer does not know what room 12 means to another, each person has their own room no 12, and it is the change in the viewer’s life at the moment, the viewer should not be afraid to take on the new challenge. They should “Spread their wings and fly”. Under the title “New Beginnings” we see the number “07072017”, this refers to the date of the exhibition and in this case, the number seven is significant to the Biblical meaning. Seven is the number of completeness. It derives from the meaning from being tied directly to God’s creations of all things. Even if our bigger journey is never completed, there always comes an end to all the parts of our journey and new chapters begin. We can always trust in God to guide us through these chapters. 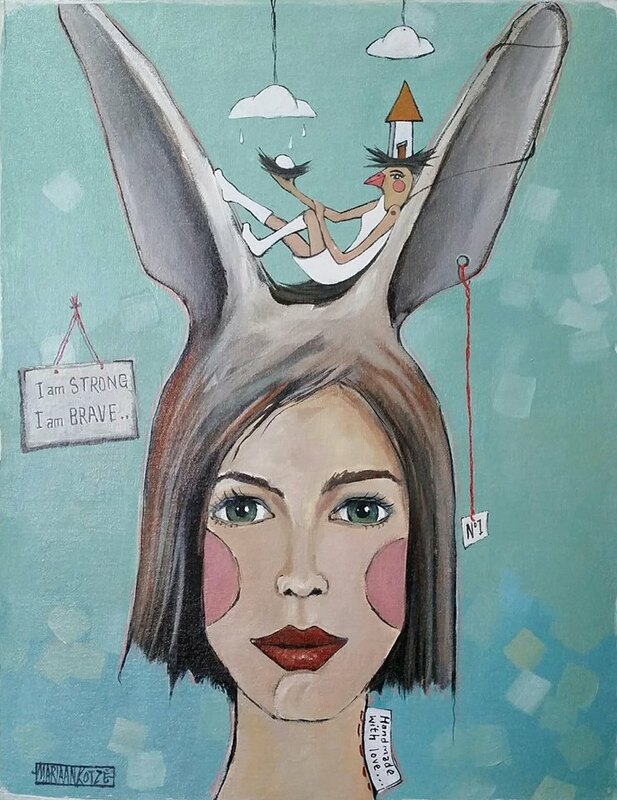 Posted in Blog and tagged paintings, Mariaan Kotze, symbolic art, vintage, Rabbit, woman in art, weathered suitcase, keys, escape, inspiration, freedom, white feathers.